I paused. “Not a bad design. How’s that working for you?” Chase didn’t like what he was hearing. How is your day designed? This entry was posted in Accountability and tagged accountability, work, work design on June 8, 2018 by Tom Foster. It stings against political correctness, but if you consider, for a moment, that statement is true, what changes? What if, it is all about the work? What if the purpose of your organization is to actually get some work done, solve a problem, execute a solution? It’s not for every organization, only those with the intended purpose to get work done, complete a task, achieve a goal. Some organizations are designed around other intentions, religious organizations, political organizations, educational organizations, collegial organizations, all with purpose, all with goals. What if the purpose of your organization was to get some work done? What if your organization was designed around the work? 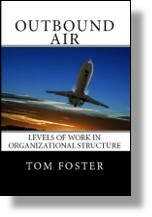 This entry was posted in Organization Structure, Time Span and tagged accountability, authority, organizational structure, work, work design on December 18, 2012 by Tom Foster. This entry was posted in Accountability, Time Span and tagged accountability, huddle meetings, meetings, priorities, work design on November 28, 2012 by Tom Foster. So, now we are left to think about your target completion time. If you truly believe that Stratum IV capability is required for success in this project, then I must assume the real “by when” of this goal is longer than you have stated. We need more data to see more clearly. Give us some more clues. I have tried to tackle the clues, below, as a task assignment using CPQQRT (Context, Purpose, Quantity, Quality, Resources, Time) hopefully alluding to the longer term focus. Task: Develop a comprehensive plan to ensure the pool of labour we draw our staff from continues to provide the capability we need. Context: Our current labour pool is shrinking. Baby boomers are retiring, competitors using the same labour pool, increased community expectations around diversity hires. Purpose: Without the labour, our operations will grind to a halt, or become nonviable due to increasing labour costs. Quality/Quantity: A comprehensive plan – ie One that contains clear actions across a timeline extending out a further 12 months. This needs to also tie into our 5 year plan + take into account the expected changes in our industry and society over the next decade. I expect the plan to include the development of the labour pool through schools, universities and other external means, which by implication requires connecting with people in those institutions as well as various government departments. I would also expect you to conduct some external research into best-practice, population economics, intended changes in legislation. Resources: You personally develop the plan and you make decisions on what to include/exclude. You may make use of a researcher/assistant to gather and interpret data as necessary. You have full access to anyone in the business, especially the senior leadership team. Timeline: The plan is due by end Feb 2013. You will be expected to present it to the Executive Leadership Team and handle any questions from that team. Is the capability required to complete this task assignment S-II, indicated by the six month Time Span of the Target Completion Time? Or is the capability required higher than S-II indicated by the likely State of Thinking (Declarative, Cumulative, Serial or Parallel)? As I read your narrative, it becomes clear that this is a writing assignment to produce a written document. It appears that actual execution is NOT part of this task. But what is the goal? If the goal is to simply write a document, collecting all these elements together into a coherent narrative, then I lean toward S-II, Cumulative processing. But I don’t think that’s the goal. A plan is not a goal. A plan is a tool, the design phase of a longer task assignment, and will require a higher level of capability. The goal is actually to execute the work designed in this document, to create a labor (American spelling) pool in the face of shifting labor pool obstacles. I believe the document is the work design step in a much longer task assignment. Given the challenges faced, what is a reasonable amount of time you (as the manager) would give someone to create this stable, predictable and available labor pool? You already stated that “clear actions extending out further than 12 months, expected changes in our industry and society over the next decade” would be a required element of this design. I suspect that a reasonable amount of time is 2-5 years plus, easily extending this task assignment to S-IV Parallel processing. An example. In South Florida, we are seeing a modest and slow recovery in the commercial construction sector. And we are hiring. However, our pool of unskilled labor disappeared during the recession. Many returned to their home countries, others found work in other sectors. Available workers do not possess the skills required to complete the available work. This is a tough problem, even beyond the scope of a single company. Contractor associations and trade groups are attempting to grapple with the same issues you describe. This will be a long term challenge, not solved within two years. It will require the development of skills training programs, recruiting unskilled workers into those training programs, creating conditions for workers to return from foreign countries. This is clearly a 2-5 year problem, will require a minimum of S-IV Parallel processing. This entry was posted in Accountability, Time Span and tagged level of work, planning, work, work design on November 7, 2012 by Tom Foster.